Sheetal: Necklace and earrings with rose-cut diamonds, emeralds and rubies on white gold; bracelet with South Sea pearls, rubies and diamonds on white gold; bracelet and ring with rubies, emeralds and diamonds on white gold. All from Rose, Mumbai. Sari, by Jyotika Jhalani, for Janavi; watch, from Franck Muller; gold stilettos, from Jimmy Choo. All from Sheetal's personal collection. Biren: Jadau brooch, from Rose, Mumbai. Black Jodhpuri bespoke jacket; watch, from Hublot; shoes, from Bruno Magli. All from Biren’s personal collection. Sheetal: Earrings with rose-cut and briolette diamonds on white gold; bracelet with full-cut and briolette diamonds on white gold; bracelet with diamonds on white gold. All from Rose, Mumbai. Dress, from Ted Baker; Picadilly watch, from Backes & Strauss; black stilettos, from Furla. All from Sheetal’s personal collection. Biren: ‘Humble Bee’ and flower lapel pins, from Rose. Mumbai. Shirt, from Paul Smith; trousers, from Hugo Boss; shoes, from Bruno Magli. All from Biren’s personal collection. Necklace with 290 carat Columbian emerald and diamonds on white gold; earrings with Columbian emeralds and diamonds on white gold; ring with 37 carat Columbian emerald and diamonds on white gold. All from Rose, Mumbai. Black gown, by Shantanu & Nikhil; Rig Bang 38 Black Magic watch, from Hublot; black stilettos, from Furla. All from Sheetal’s personal collection. A rose by any other name is as – glittering, fabulous, exclusive? Let me start at the very end. Of the Verve shoot, that is. That defining moment when Sheetal Vaidya walked out of her bedroom. Hung around her neck was a colossal emerald, the size of a tear-shaped rock. She remained uncaring about the sighs all around. She looked like a goddess and she knew it. Sheetal has been wearing her husband Biren’s jewellery since she was married 21 years ago and has perhaps gotten used to the glances and asides. She wore that rock like she was born to it. 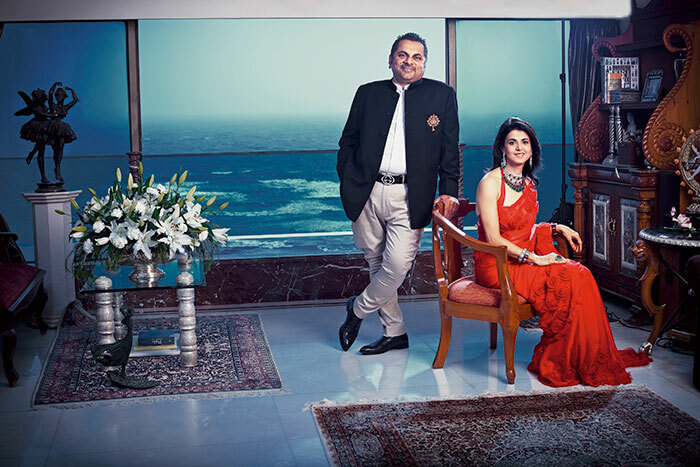 Sheetal and Biren Vaidya of Rose, makers of fine jewellery, are in their Breach Candy home. He wears a striped blue and white shirt of no great import except for the touches of fine jewellery. A bee sits in the centre, its wings sparkling diamonds. It seems to be flying towards a diamond flower set safely on Biren’s pocket. Biren has a story to tell about the ‘humble bee’. The humble bee returns to the flower as long as the flower supplies it with nectar and pollen. When it stops, the humble bee, he says, will drift from flower to flower. His piece of jewellery certainly proves to be a great conversation opener. I wonder if he is the humble bee and decide that indeed he is, when I realise that Biren to all his friends is Bee Vee, a pet name that has stuck over the years and become almost an official tag! I take the ‘Rose walk’ through the luxurious Rose salon on Mumbai’s Breach Candy. The room has plush carpets, the temperature is set just right; there is a pervading aroma of green tea and spices. I am walked past the cases of jewelled Ganeshas crafted by Biren, hand-picked ceramics, silver artifacts and of course the stunning pieces of jewellery as well as some jadau sets. One section displays high-end watches. Everything, in fact, for a society shaadi. A haven indeed for the bride and groom on a shopping day out. He is proud about his designs and declares that designing is his big passion. Sheetal says that he loves to sketch at their home in Alibaug where things are quiet and peaceful. She is still stunned by some of his three-dimensional sketches. “He will look at a person, see the personality and start sketching jewellery,” she says. He is inspired by all of nature – trees, plants, flowers, the sea, “….by places, destinations, fabrics, art, architecture, embroidery. I don’t call myself a designer because everything that everyone makes goes back to His creation. I prefer to call myself an ‘aspiring impressionist’. The ‘My trousseau, my collection’ pieces incorporate fancy gems in free flexible movements. A new line of bracelets is inspired by traditional kadas called balas, giving these a modern twist. ‘Brides and beads’ hangs strings and bunches of beads with diamonds and pearls. ‘Purely pearls’ is what it sounds like, bringing together a variety of pearls from South Sea to fresh water. ‘Roses by Rose’ is a new collection of rose cut diamonds that revive a bygone age but in a new avatar. And so we come to ‘Rocks by Rose’. Back to the end where we began. Back to that stunning emerald that Sheetal wears like a queen. And queen she is. The queen of Biren’s heart and the enigmatic muse of Rose.